Hi! Dixie Lee here! 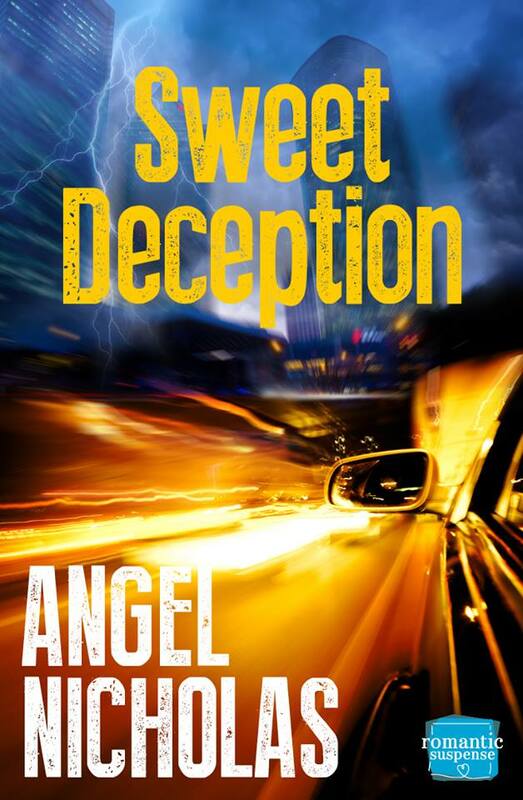 I’m so excited to have my friend and fellow author, Angel Nicholas, here today to talk about her brand new romantic suspense novel, SWEET DECEPTION. I’ve heard from reliable sources that this book is HAWT! But before she gets to Sweet Deception, I asked her to tell us a little bit about herself. 1. How long have you been writing and what drew you to write romantic suspense? I’ve been writing for about five and a half years, though I did write in high school. I stumbled across my folder of work a year ago. Reading those poems and short stories was quite a maudlin journey back in time! Apparently, I had a flair for dark drama even as a teenager. Yet nothing is so appealing as a love story. What else would I write if not romantic suspense? I adore love stories, and read across all the romance genres, but romantic suspense has always held the strongest draw for me. 2. Who is your favorite character in Sweet Deception, and why? What a difficult question! That’s like asking me which of my children is my favorite. They’re all fabulous for different reasons. Ally comes into her own through the course of the story so beautifully, and discovers this remarkably strong woman inside her previously exterior. Yet, Detective Marsing is so tormented beneath his deliciously charming, Devil-may-care exterior. I will say that none of the villains in this story were my favorite. I have a soft spot for villains, but they’re so truly heinous in Sweet Deception. 3. What do you like to do when you’re not writing? This question seems to imply I should have an enjoyable hobby outside of writing. I didn’t get that particular memo. In my very rare spare time, I adore the arts. Quality museums, plays, ballet, and various types of concerts. Travel, of course. Fine dining. I’m a horrid food snob. Going for a quiet walk along the river or ocean is always wonderful, though something I’m seldom able to indulge. Her boring existence seems perfect until a charming detective threatens Ally’s heart and lethal contract killers jeopardize her happily ever after. Ally Thompson’s life is perfect. Calm, quiet, some might even say boring. The sole survivor of a tragic accident, she’s not the adventurous type—something she’s decided to change. A murder and a detective in disguise shatter Ally’s first attempt at “fun.” Detective Greg Marsing is everything Ally knows better than to want. The gun-totting, tattooed scumbags trying to kill her are almost a welcome distraction from her pointless attraction. A contract on Ally has every lowlife for miles gunning for her. Sparks fly while she and her unlikely hero scramble to unravel clues. As the deadly game escalates, Greg has to decide if self-preservation rates higher than a love worth dying for. Oh, God! He was shooting at her. Actually shooting. In broad daylight. In her neighbor’s backyard. Didn’t they have rules about that sort of stuff? Nerves shredded, Ally gritted her teeth. Three more feet. Two. Another crunch. She swore the heat of the bullet singed her shoulder. Arms extended, she jumped for all she was worth. Up, braced her arms and pushed off. She landed with an oomph on the other side, followed by another crunch and a hole in the wood fence. For a split-second, she crouched panting, staring in disbelief at the fence towering over her head. Had she really done that? Cursing from the other side got her up and moving again. Squealing tires and a revving engine brought her head around. A car tore into the alley and raced toward her. More bad guys? Had he called in reinforcements? Did I do something horrible in a past life to deserve this? Truly, I’ll help the poor. Serve food at the soup kitchen. Go to church every Sunday. Donate money to the shelter. I’ll even babysit my friend’s bratty kids. Just please, please, please get me out of this alive. The shiny black Camaro careened to a stop with the driver’s side door facing her. Heavily tinted windows revealed nothing. In a last desperate bid for freedom, she darted past the door. Strong arms encircled her waist and dragged her back toward the idling car. “No!” Ally screamed like a banshee, flinging out her arms and legs, scrabbling for purchase. Hard hands sent her flying across the front seat. “Let me go!” She dove for the door handle. Almost blind with panic, she twisted around and crouched on the seat, prepared to draw blood. Shocked hazel clashed with furious aqua. Her mouth fell open. Muttering under his breath, Detective Marsing threw the car into gear and spun out of the alleyway. She whipped her head around in time to see a blocky head pop up over the privacy fence as they disappeared around the corner. She’d done it. Escaped. Stayed alive. Like an atomic bomb, the events of the past hours and the emotions she’d worked so hard to control mushroomed up, exploding inside. Tears stung. The only girl in the midst of four brothers, Angel Nicholas spent her childhood hiding behind romance novels. Now the mother of four overly-energetic children, a Whimsy kitty and slobber-flinging Great Dane, fiction is still her refuge. Excessive caffeine fuels her typing, stiletto heels maintain her sass, and the splendors of Idaho alongside its gregarious people inspire her muse. Find Angel on Facebook, Twitter, Google+, Goodreads, and on her website! 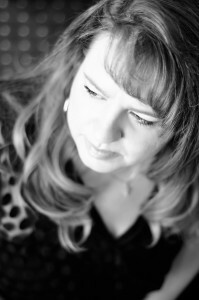 You can also favorite her Amazon Author Page to receive emails when new books are available! 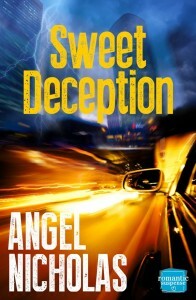 This entry was posted in Books and tagged Angel Nicholas, romance, Romantic Suspense, Sweet Deception. Bookmark the permalink.